How can I help the Waialua Library? Libraries across the nation are facing budget cuts. In Hawaii, library hours have been lost, staff positions have been cut, and some libraries have been threatened with closure. However, there are many ways you can help Waialua Public Library survive and thrive. * Become a Friend of Waialua Library. * Make a donation to the Friends of Waialua Library. 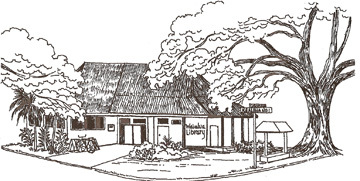 * Attend Waialua Library events and patronize your library. State decisions regarding library closure are based on many factors, including patronage and circulation. * Purchase a mug or t-shirt, shop at the monthly Used Book Sale. Proceeds go toward new library materials.